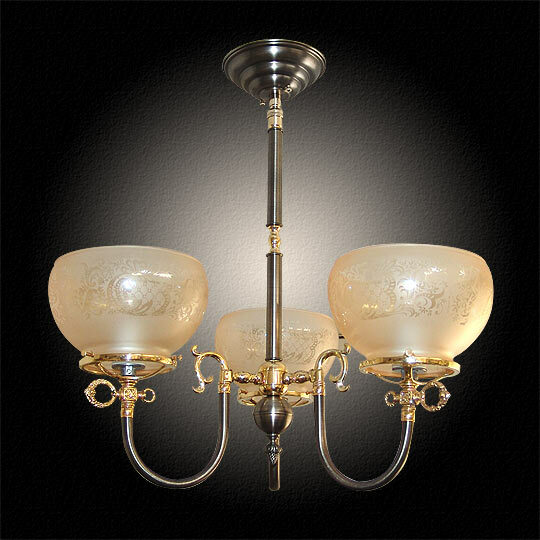 Shown in a darker Antique Pewter and Polished Brass combo, this custom gaslight reproduction features faux gas keys and hand blown acid etched French glass shades. Matching wall lights are of course available as well. Shown in Antique Pewter and Polished Brass. Available in different Metal Finishes, different Glass, Back Plate, more or fewer arms, arm direction, tubing style and many other Custom Options.